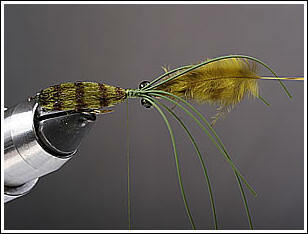 This is one of my favorite patterns for early season fishing in the lakes where i live. 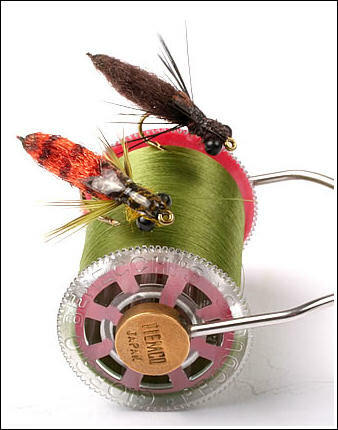 The fly sinks well, though it is not very heavy. 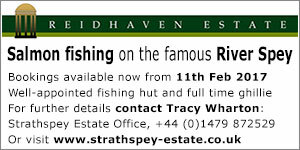 A nice combination when you are fishing with light rods. It might be “dangerous” to call it by my name. Maybe some of you have already tied, and used it for years. Anyway it is a neat way to make an extended body without a lot of work. Hook: TMC 107SP, # 8 orTMC 921, # 8. Thread: Olive or Brown, same as abdomen. Extended body: Olive or brown antron yarn. Legs: Xsmall or fine, round rubberlegs. Eyes: Black bead chain eyes, small. 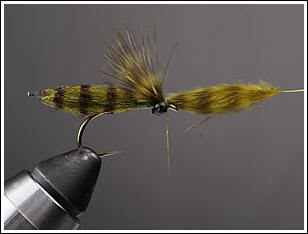 Wingcase: Olive or brown grizzly marabou. 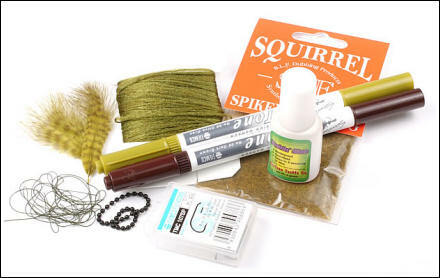 Thorax: Brown or olive Squirrel SLF Dubbing. 1: Cut 5cm long pieces of antron yarn, moisten them. Use a thick sewing thread and make knots around the yarn. Make 4 or 5 knots. This will make a nice little "tip" on the end of the body, just like the real ones have. 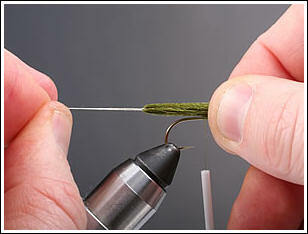 2: Fasten hook and wrap two layers of thread on the first 1/3 of the hook shank. 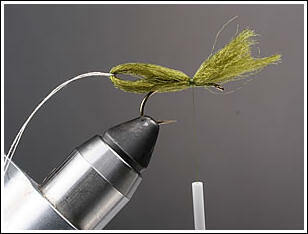 Pull the sewing thread when you tie in the extended body. 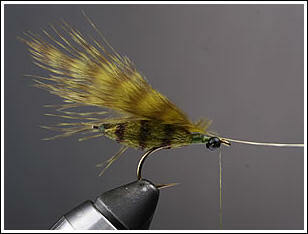 By doing this you will get the typically "cigar" shape of the dragonflys body. 3: Now it looks like this. A loop from the side. 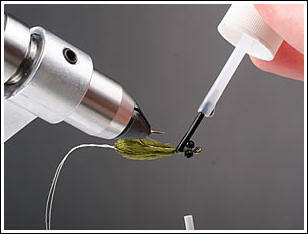 Make sure that the body is well centered on the hook. 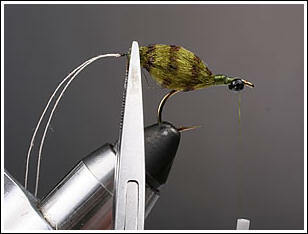 4: Tie in the eyes on the underside of the hook and secure thread wraps with some super glue. 5: If you like some fancy stripes on the body, now it is time for that! 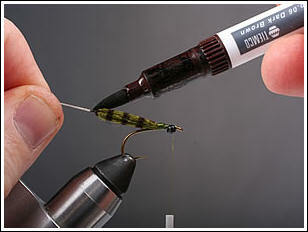 6: Time to shape the body: Add superglue on the tip of the body aprox. first 3mm. Before the glue dries use a forceps etc. and squizze and push a little. If you blow gently the glue will cure faster..
7: The body is ready! 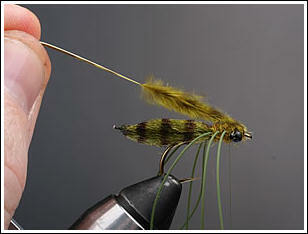 8: Fasten a grizzly marabou feather and pull forward. 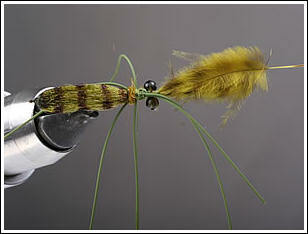 9: Take 3 pcs of 6cm long rubberlegs and tie in on the top of hook. Let them slide on the thread to the correct placement. 10: Tie down all legs forward.. This will make it easier for you to tie them in the correct place later. 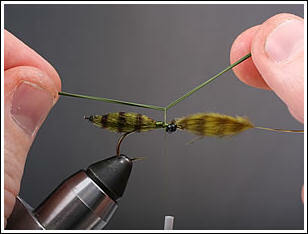 11: Pick the legs that are closest to the place you want to tie them in. 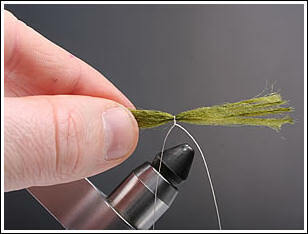 2 or 3 wraps of thread. One on eace side. 12: After the first pair of legs i dub a little in front of them. And repeat with the second pair. 13: Dub in front of the second pair of legs. Tie in the third and dub infront of them too. 15: Cut of the wingcase to desired length. And cut the legs, i cut all on one side together at the point where the body ends. 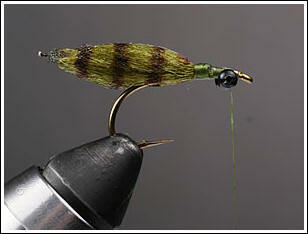 Thin skin or turkey feathers also makes nice wingcases. 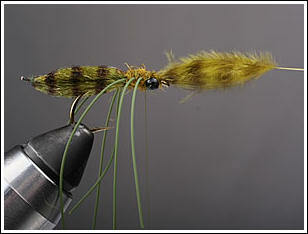 I also use soft hackle as legs. © Mats Sjöstrand 2015 If you have any comments or questions about the Magazine, feel free to contact me.